Write in your desired inscription, and click Buy. It’s that easy. $14 gets you a copy of the book, a personal inscription, a collectible Gay Uncle bookmark, and first class shipping to anywhere in the U.S. What are you waiting for? That kid is not going to raise itself. BUY BUY BUY! 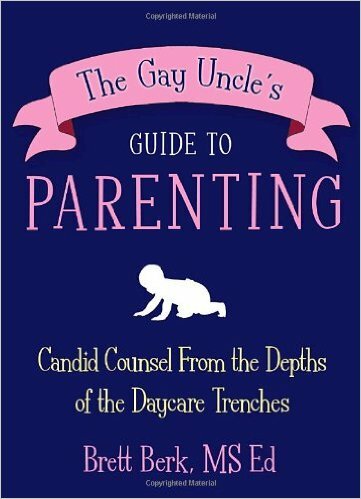 The Gay Uncle’s Guide to Parenting (A Three Rivers Press Original, March 2008), is the sassy, funny, even in-your-face guide to navigating the pitfalls of modern parenthood. Brett has over twenty years of experience working with young children, but no kids of his own, and he uses this fresh, outsider�s perspective–combined with a hilarious no-nonsense approach-��to break moms and dads out of the problematic patterns and practices they�ve fallen into. Why do we buy Diaper Genies as if we�ve never heard of trash cans with lids? Why are we so afraid of telling children �no�� that we often take the scenic (and nonsensical) route around it? And can we all finally admit that baby poop does indeed stink, accept it, and move on? Buying Stuff: The baby industry has become very adept at selling you items you don�t need, playing on your fears that you�re ill-equipped for the job and are going to do it all wrong. No wonder we have a generation of parents who have so much trouble being the grown-up. Everything they buy is telling them they�re a bunch of silly little babies. Whining: Do not ever give in to whining. If you do, your child will quickly come to believe this an appropriate and effective means to get what they want, and you will have signed yourself up for a lifelong tasting in their extensive whine cellar. Going Out: While it�s against the law in many states to leave a child under eleven alone, it is truly criminal for you to wait that long to take some time for yourself. Form a Sitter Stable and GET OUT OF THE HOUSE! Say it with me: I�m a parent and a person. Toilet Training: Routines help remove emotion from potentially tense situations. That�s why the assembly line was invented. Think of yourself as the factory foreman: you�re there to lay out a rational and efficient process. If you freak out every time someone tightens a bolt, the car will never get built. Food and Mealtimes: Just as you don�t let your kid pee in the houseplants or brush his teeth with the cat�s tail, eating should have its own set of rules, tools, and locations. The Gay Uncle’s Guide to Parenting is the must-have book for every new parent and parent-to-be. Filled with humor, candor, and, most importantly, great advice, this truly is a manual that will prove its worth for years to come.